[prMac.com] Berkeley, California - Creekcats LLC is today proud to announce the release and immediate availability of Caidanshuo 2.5, their English to Chinese menu translator for iPhone, iPad, and iPod touch devices. "Caidanshuo" is Chinese for "The Menu Says," which is an excellent description of exactly what this app does. The app was designed to make ordering as easy as taking a photo and cropping as needed. It immediately begins translating the menu into Chinese, resulting in an easily understandable menu to read and order from. The app offers the translation of over 38,000 menu-related phrases, and makes use of a custom-designed translation engine. Anyone can take a photo of an English menu, crop as needed, and tap "Translate." Caidanshuo can translate an entire column of a menu at once. The results are presented in an easy-to-read typeface, with each line of the original menu immediately followed by its translation; the traveler can simply point to what they want to order. Its easy-to-use interface offers a handy feedback feature, allowing users to offer comments and suggestions directly to the app's developers. * Each line of the menu is displayed with its translation immediately below it, so it's easy to match each item to its translation. The idea for the company's first menu translation app, Le Menu Dit, came about during a trip to Germany by developer Phil Price and his family. A limited German vocabulary and no convenient way to translate the menu led to a less than satisfactory dining experience for Phil's group, and planted the seed for his first menu translation app. Upon returning from their trip, Phil and his two friends, Nathan Addy and Yixing (Ethan) Chen, set to work on developing the Le Menu Dit app. The response from app users has inspired Phil and his friends to expand their lineup of menu translation apps, resulting in their latest release, Caidanshuo. "Le Menu Dit was well received by users, and we were very happy with the initial reception," says Phil Price, creator of Caidanshuo. "Our users and some reviewers gave us so much great feedback, that it inspired us to create versions of the app for other languages. Our latest app, Caidanshuo, offers Chinese speaking travelers the ability to order food in native American restaurants, with no fear of a limiting language barrier. After all, experiencing and enjoying the cuisine of a country you are visiting is one of the best experiences of international travel." * The app is designed specifically to make it easy to order from a translated menu: Each line of the menu is followed by its translation, making it easy to figure out which item on the original menu corresponds to the correct item in the translation. * Reliability. The app works very well on most menus, and gives an acceptable translation on most other menus. The translation is in bold, easy-to-read type. * No Internet connection is required. Many apps of this type require an Internet connection, or perform poorly if one isn't available. Caidanshuo's translation dictionary is all compactly stored on the device, so it doesn't require an Internet connection. * The app's user interface is designed to be easily understood, so users can easily use it the first time, every time. Caidanshuo's low learning curve makes it perfect for use by any user. Caidanshuo concentrates on doing one task, and doing it well. 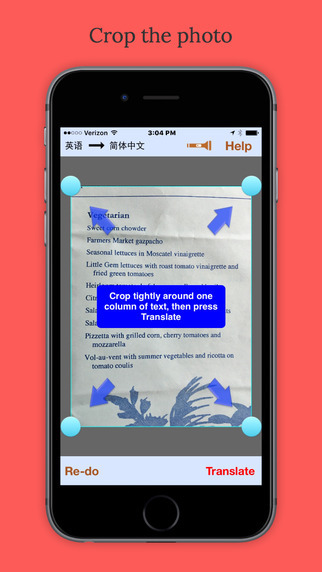 The app quickly translates a menu from English to Chinese, and displays the translation in a clear, easy to read way. This makes it easy for anyone to simply point to what they want to order, making for an enjoyable dining experience, no matter the language barrier. Menu translation is merely a matter of point, shoot, crop, and wait a moment for the translation. The app offers much more reliable menu translations than jack-of-all-trades type translators ever could. Caidanshuo is based on the same powerful and efficient menu translation engine as Creekcats other popular menu translator apps for iOS devices, Le Menu Dit (translates English menus to French), Il Menu Dice (translates English Menus to Italian), and The Menu Says, which translates French menus to English. Caidanshuo 2.5 is just $1.99 USD (or an equivalent amount in other currencies), and is available worldwide exclusively through the App Store in the Travel category. Review codes are available upon request. Headquartered in Berkeley, California, Creekcats LLC was founded in 2013 by Phil Price, Juliet Lamont, Mary Price, and John Price. The company was born from a desire to create apps that would make user's lives easier, by supplying tools to aid them in their everyday lives. Copyright (C) 2016 Creekcats LLC. All Rights Reserved. Apple, the Apple logo, iPhone and iPod are registered trademarks of Apple Inc. in the U.S. and/or other countries.